This story illustrates our tendency to want quick fixes to our problems. If you approach D&C 111 from this angle, this story helps to show the results that come from seeking “quick fixes”. The author’s conclusion would be modified by taking a look at Jacob 2:18 – the real purpose of wealth: to build the Kingdom of God. When we seek to build His Kingdom, we have pure motives in our acquisition of material wealth. 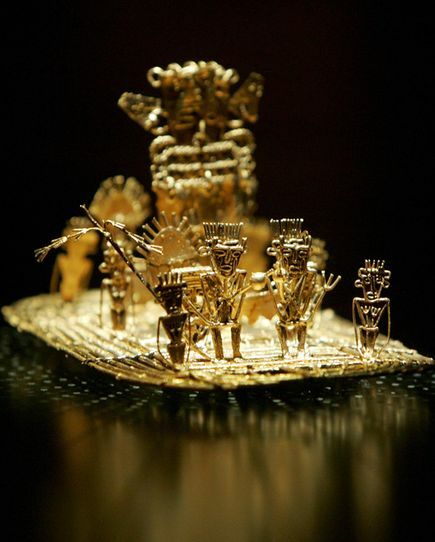 The scene depicted in this ancient artwork, on display at the Gold Museum in Bogota, Colombia, shows the origin of the El Dorado myth. Legend tells of a king who would cover himself in gold dust during festivals, then dive from a raft into Lake Guatavita. After Francisco Pizarro conquered Peru, in 1532, gold from the Incan Empire began to pour into Spain, and Spaniards of all classes started dreaming of the instant riches to be had in the New World. The story soon spread of an Indian chief to the east of Peru who once each year would ritually cover himself in gold dust and dive into a lake. Soon word of mouth transformed El Dorado, the “Golden Man,” into an empire called El Dorado, wealthier than the Incan, where the streets were paved and the buildings inlaid with gold. This elaboration of the story did not seem implausible, for surely a chief who could afford to waste gold dust in a lake must rule a golden empire. Soon Spaniards were searching for El Dorado all over northern South America. In February of 1541, the largest expedition yet in this venture, led by Pizarro’s brother Gonzalo, left Quito, in Ecuador. Resplendent in their armors and colorful silks, 340 Spaniards headed east, along with 4,000 Indians and close to 1,000 dogs. But the expedition was soon hit by torrential rain, which rotted its gear and spoiled its food. Meanwhile, as Gonzalo Pizarro questioned the Indians they met along the way, those who seemed to be withholding information, or who had not even heard of the fabulous kingdom, he would torture and feed to the dogs. Word of the Spaniards’ murderousness spread quickly among the Indians, who realized that the only way to avoid Gonzalo’s wrath was to make up stories about El Dorado and send him as far away as possible. As Gonzalo and his men followed the leads the Indians gave them, then, they were only led farther into deep jungle. The explorers’ spirits sagged. Their uniforms had long since shredded; their armor rusted and they threw it away; their shoes were torn to pieces, forcing them to walk barefoot; the Indian slaves they had set out with had either died or deserted them; they had eaten not only the swine but the hunting dogs and llamas. They lived on roots and fruit. Realizing that they could not continue this way, Pizarro decided to risk river travel, and a barge was built out of rotting wood. But the journey down the treacherous Napo River proved no easier. Setting up camp on the river’s edge, Gonzalo sent scouts ahead on the barge to find Indian settlements with food. He waited and waited for the scouts to return, only to find out they had decided to desert the expedition and continue down the river on their own. The rain continued without end. 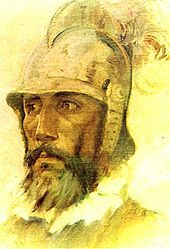 Gonzalo’s men forgot about El Dorado; they wanted only to return to Quito. Finally, in August of 1542, a little over a hundred men, from an expedition originally numbering in the thousands, managed to find their way back. To the residents of Quito they seemed to have emerged from hell itself, wrapped in tatters and skins, their bodies covered in sores, and so emaciated as to be unrecognizable. For over a year and a half they had marched in an enormous circle, two thousand miles by foot. The vast sums of money invested in the expedition had yielded nothing – no sign of El Dorado and no sign of gold. Even after Gonzalo Pizarro’s disaster, the Spaniards launched expedition after expedition in search of El Dorado. And like Pizarro the conquistadors would burn and loot villages, torture Indians, endure unimaginable hardships, and get no closer to gold. The money they spent on such expeditions cannot be calculated; yet despite the futility of the search, the lure of the fantasy endured. Not only did the search for El Dorado cost millions of lives – both Indian and Spanish – it helped bring the ruin of the Spanish empire. Gold became Spain’s obsession. The gold that did find its way back to Spain – and a lot did – was reinvested in more expeditions, or in the purchase of luxuries, rather than in agriculture or any other productive endeavor. Whole Spanish towns were depopulated as their menfolk left to hunt gold. Farms fell into ruin, and the army had no recruits for its European wars. By the end of the seventeenth century, the entire country had shrunk by more than half of its population; the city of Madrid had gone from a population of 400,000 to 150,000. With diminishing returns from its efforts over so many years, Spain fell into a decline from which it never recovered. Power requires self-discipline. The prospect of wealth, particularly easy, sudden wealth, plays havoc with the emotions. The suddenly rich believe that more is always possible. The free lunch, the money that will fall into your lap, is just around the corner. This entry was posted in Doctrine and Covenants, Uncategorized and tagged finding solutions to our problems. Bookmark the permalink.